EaseUS Partition Master Free Edition v13. 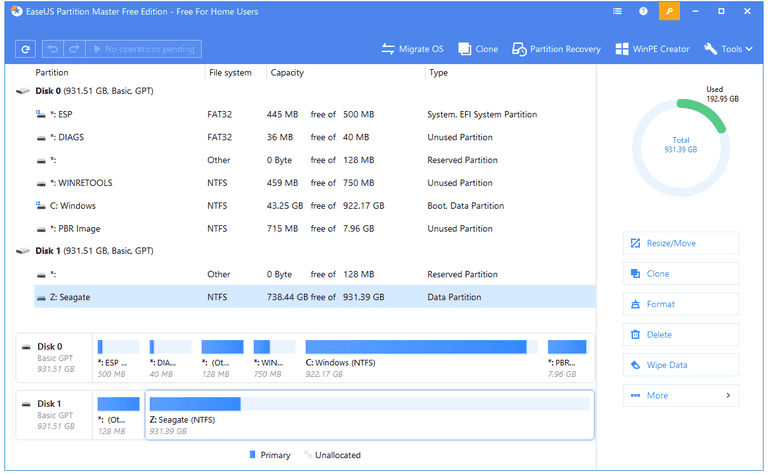 EaseUS Partition Master Free Edition is incredibly simple to use, one of many reasons that you should consider it when looking for a good free disk partitioning tool. There's a lot to like about the free edition of this program but you should know that there's also a paid version, EaseUS Partition Master Professional, with a few extra abilities. More on this below. I love that the changes you make with EaseUS Partition Master Free aren't immediately applied to the disks. It makes it way easier to play out what will happen after you've made all the changes. For example, you can resize a partition, format the resulting unallocated space, and then change the drive letters all in just a few moments, and then see what the result looks like before actually doing any of it. The program interface will change to reflect what you've done, but none of it will actually apply to the disks until you click the Execute button. I also think the overall look and feel of EaseUS Partition Master Free makes whatever you're doing with your computer's partitions easy to understand and accomplish. The options aren't too overwhelming and each of them are accurately named. Additionally, I really like how detailed the explanations and tutorials are in their online manual, super helpful if you're still not quite sure what to do. Before the program finishes installing, you might be asked to install another EaseUS program like Todo Backup Free, or something totally unrelated like an antivirus program or something else. You can skip over that part if you want by clicking Decline when asked.